Maybe it´s because, to start with, it was the policy makers errors that drove the economy to the tipping point. But if they have the power to “tip” it, they must also have the power to “untip” it. So many wonder why they (the policy makers) have “abandoned ship”. The main point of our op-ed, as well as our earlier work, is that most of the increase in per-capita output that occurred after 1933 was due to higher productivity – not higher labor input. 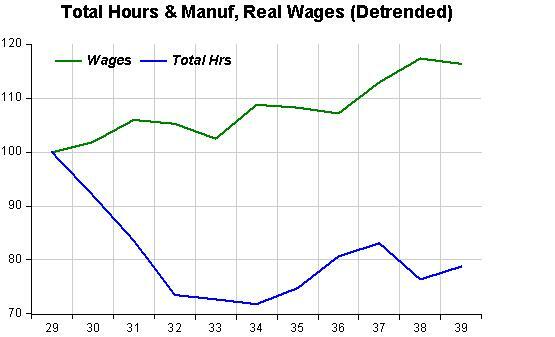 The figure [at the link] shows total hours worked per adult for the 1930s. There is little recovery in labor, as hours are about 27 percent down in 1933 relative to 1929, and remain about 21 percent down in 1939. 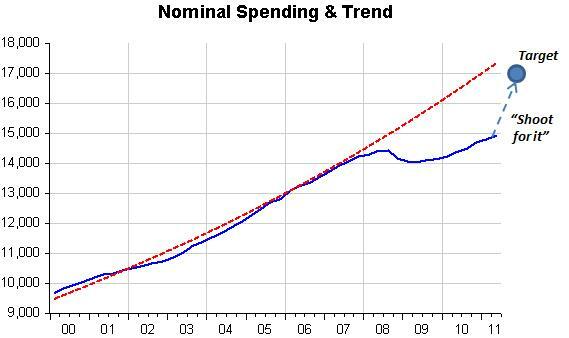 But increasing aggregate demand is supposed to increase output by increasing labor, not by increasing productivity, which is typically considered to be outside the scope of short-run spending/monetary policies. 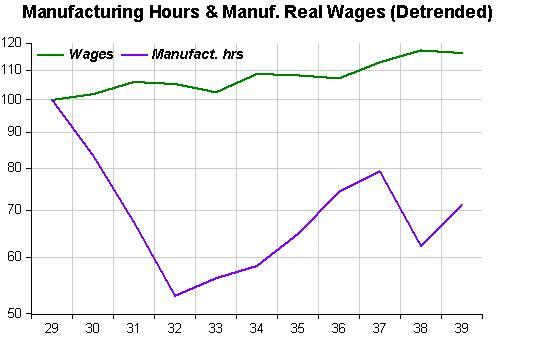 While for total hours the change between 1933 and 1937 is from 27% below normal to 17% below normal (the hours data are not detrended), a substantial increase in total hours, in the case of manufacturing hours, the gain in 1933-37 is relatively “immense”: from 47% below normal to “just” 21% below normal! Leading them to conclude that it wasn´t about increasing AD, but about higher productivity. 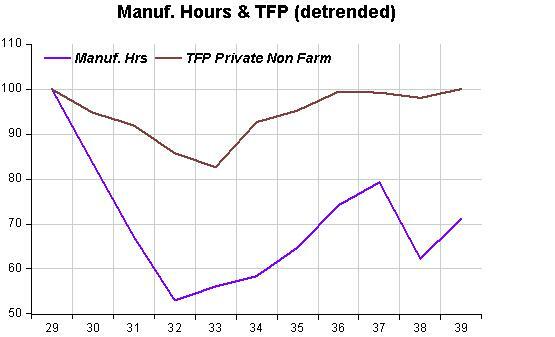 The following picture, showing TFP and manufacturing hours would justify the opposite conclusion, with manufacturing hours increasing robustely! The point is that in either case there is strong support for the AD view of the recovery from the great depression. 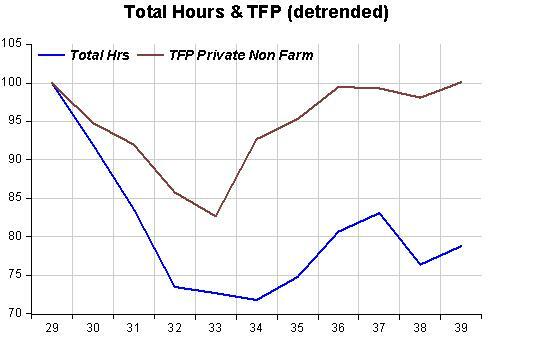 Note also that productivity flattened in 1936, while hours continued to increase for another year! 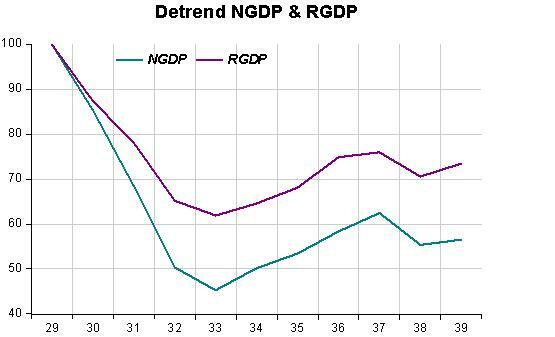 The final graph indicates there´s no doubt about the effect of AD with AD rising after 1933 and bringing RGDP up commensurately. So yes, C&O were very “selective” with their dates and data to further their RBC view of the world. It seems that productivity went up due to an increase in AD, allowing a more efficient deployment of resources. It is the policy that dare not speak its name: the printing press. The time has come to employ this nuclear option on a grand scale. The alternative is likely to be a lost decade. The waste is more than unnecessary; it is cruel. Sadists seem to revel in that cruelty. Sane people should reject it. It is wrong, intellectually and morally. It is vital, then, to sustain demand. With fiscal policy set on kamikaze tightening and conventional monetary policy almost exhausted, that leaves “quantitative easing”. Mr Posen recommends a great deal more of it, starting with “a minimum of £50bn in gilt purchases in secondary markets” though he now boldly recommends something closer to £75bn or £100bn, in light of the dire external environment. For example: Specify a TARGET and “shoot for it”! In his first public remarks since the Fed launched a fresh measured aimed at keeping down long-term borrowing costs, Bernanke indicated a willingness to push deeper into the realm of unconventional policy if economic growth remains anemic. First, the counter-cyclical effect of reducing interest rates in recessions is dampened. When interest rates dipped in the past, at least part of their immediate expansionary impact came from the belief that interest rates would bounce back to normal levels in the future. Firms would rush to avail themselves of cheap credit before it disappeared. However, if interest rates are expected to stay low indefinitely, this short-term expansionary effect is weakened. Second, financial intermediation within the banking system is disrupted. Since early 2008, bank credit to firms and households has declined despite the Fed’s huge expansion of the monetary base—almost all going into excess bank reserves. The causes are complex, but an important part of this credit constraint is that banks with surplus reserves are unwilling to put them out in the interbank market for a derisory low yield. This bank credit constraint, particularly on small- and medium-size firms, is a prime cause of the continued stagnation in U.S. output and employment. Third, a prolonged period of very low interest rates will decapitalize defined-benefit pension funds—both private and public—throughout the country. In California, for example, pension actuaries presume a yield on their asset portfolios of about 7.5% just to break even in meeting their annuity obligations, even if they were fully funded. Perhaps Fed Chairman Ben Bernanke should think more about how the Fed’s near-zero interest rate policy has undermined fiscal discipline while corrupting the operation of the nation’s financial markets. Both are wrong. They seem to believe that the Fed determines long term interest rates, and while for one low rates are “expansionary”, for the other low rates can be distortive, in effect blocking the credit expansion needed for recovery. Remember that when QE2 was launched – with the stated reason of reducing long term rates – long term rates went up! That lasted while it was thought that the Fed was adopting an expansionary MP. When agents understood the “ruse” – that it was just a means to avoid deflation, not promote long lasting economic expansion – long term rates dropped fast, reflecting expectations of continued lackluster spending growth. [I]n fact, monetary policy can be successful if it partners the monetary injection with an explicit account of expectations. If monetary policy was conducted by announcing that the central bank would increase the monetary base until it met its target for a particular variable — say the price level or nominal income — this would help to shape expectations and help policy to be successful as the increase in the monetary base would have distributional effects. “No way out”: Commit or die! Recent declines in inflation expectations, as measured in government bond markets, are worrisome, James Bullard, president of the Federal Reserve Bank of St. Louis said in an interview with The Wall Street Journal. Mr. Bullard has pushed internally for the Fed to use asset purchase programs as its main tool for providing an additional boost to the economy if it is needed. Other Fed officials favor different approaches. For instance, Chicago Fed President Charles Evans wants the Fed to promise to keep short-term interest rates near zero until unemployment drops below 7.5% or unless inflation rises to near 3%. Mr. Bullard said he isn’t not for these kinds of commitments. And Evan´s suggested commitment is far from being the most effective one. Josh Hendrikson has a very nice post on the symbiotic relation between policy and expectations, in particular that it´s not about the “arithmetic”, or size, of the stimulus (fiscal or monetary), but about the degree of commitment of the policy maker with its stated target, which ultimately will shape expectations. Dr Merkel, what we have is the crisis of a foolish monetary union that ought to be shut down but is being kept alive because the priesthood has endowed it with sacred significance. Let stop this absurd quasi-religious charade. The euro is nothing but a currency. It has no intrinsic importance. None. To claim that Europe fails if the euro fails is hollow rhetoric. The great democracies of Europe will march on serenely. After so many “shots wide off the mark” the Fed is bound to lose credibility. That´s bad because, on the off chance that it makes the right move – an NGDP Target, or even a distant second best Price Level target – it will be hard to inspire “confidence”. “If inflation falls too low or inflation expectations fall too low, that would be something we have to respond to because we do not want deflation”. I tend to like Charles Plosser’s speeches, and this recent one is no exception. Plosser has an excellent understanding of why central bank commitment to a policy rule is a good thing, and communicates the idea well to a lay audience. Someone was gracious enough to set up a nice but no frills NGDP Level Target site. I checked with the “usual suspects” and they all pleaded “not guilty”. Would the “perpetrator” please come forward! Meanwhile, you may be interested in taking a look. There is an optimistic scenario for the U.S. economy: Europe gets its act together. The pace of world growth quickens, igniting demand for U.S. exports. American politicians agree to a credible compromise that gives the economy a fiscal boost now and restrains deficits later. The housing market turns up. Relieved businesses hire. Relieved consumers spend. But there are at least two unpleasant scenarios: One is that Europe becomes the epicenter of a financial earthquake on the scale of the crash of 1929 or Lehman Brothers 2008. The other is that Europe muddles through, but the U.S. stagnates for another five years, mired in slow growth, high unemployment and ugly politics. No one would intentionally choose the second or third, yet policy makers look more likely to stumble into one of those holes than find a path to the happier ending. Correction: We´re already inside the “hole” and some seem to like it there! A senior U.S. policy maker, a fan of Mr. Ahamed’s book, called me the other day. “Promise me,” he said, “that if you write a sequel about the Great Depression of 2012 that you’ll note that I was one of the guys really trying to head it off.” It was, in a way, one of the few encouraging things I’ve heard lately. It conveyed a welcome appreciation of how large the stakes are. We’d be better off if more policy makers realized that. Last year about this time economic conditions deteriorated to the point that we undertook discussions on how to provide further monetary accommodation—and we ended up with our second round of large scale asset purchases. Now, one year later, we again find ourselves with a weakened economic outlook and again trying to decide what further accommodation to provide. I’m sure everyone will agree that we seriously don’t want to be in this position again at this time next year. I believe that means we need to take strong action now. But that “phobia” should make him have a strong preference for some inflation. But no, he´s “capped” that at 2% tops! And that´s clearly not what the markets want. Just look at the stock market’s reaction to the fall in long term inflation expectations. Man, it´s ALREADY too low! “When you encourage consumption by inhibiting your interest rates from rising to their equilibrium level, you will in fact buy problems, and we have, in fact, bought problems”. Yes, he must be from Pluto! But it’s no longer part of an exclusive club, since there are more than 40 of these dwarfs, including the large asteroid Ceres and 2003 UB313, nicknamed Xena—a distant object slightly larger than Pluto discovered by Brown last year. I just hope that the number of “dwarf Stooges” stop coming over to “inhabit” the FOMC! Unfortunately, they’re “multiplying. This year there are already three!